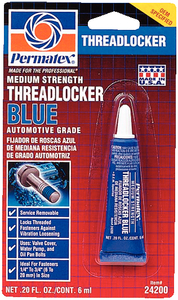 Threadlocker blue eliminates the need for lock nuts and lock washers. Locks and seals while preventing parts from loosening due to vibration. Protects thread from corrosion. Medium strength for easy disassembly.